It comes with flattened nylon plate contours that support the feet and also provides comfort. The plates make it possible for the wearer to remain the cleats for long without hurting their feet. 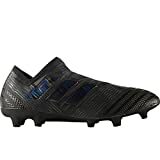 The cleats have been made through high-tech technology that makes it possible for the wearer to remain in control in both dry and wet conditions. The horizontal ridges on the upper side of the cleats are made of synthetic leather. Their purpose is to provide more control of the ball on the top side of the feet. 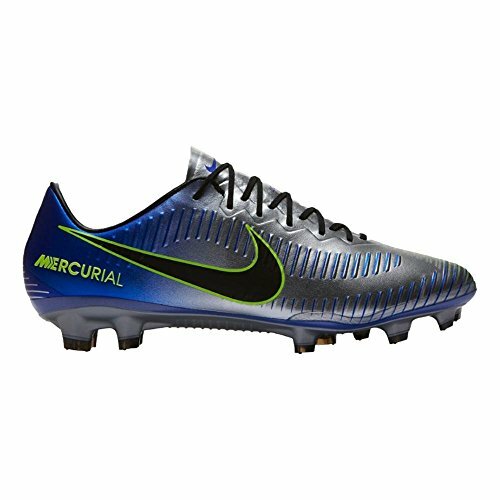 The Nike Mercurial Vapor XI NJR FG Soccer Cleat is generally higher priced than other types of cleats in the market. Their cleaning and maintenance is a little more costly and demanding. Find us one football(soccer) player on this planet who hasn't been inspired by the feats of Brazilian soccer. These cleats are a testament to all that is Brazilian and represents the highest level of inspiration mixed with creativity. The Nike Mercurial Vapor XI NJR FG Soccer Cleat is made for players with raw talent and boundless passion. The color of the cleat was inspired by the Brazilian flag, and modifications were made to bring out a vibrant Blue Orbit and Volt shade, at the request of one of the most prominent soccer players in the country. A close look at the design of the boot shows some “constellations” across the upper side cleat. They represent the path the ball followed in the build-up of the player’s six favorite goals. This set of boots comes in four official colors- white, navy, blue orbit, and volt. The upper material of the cleat provides optimal control for all types of weather. It also stretches easily to conform to the uniqueness of the feet of the wearer. Unfortunately, this feature of the material can occasionally be a drawback over time because it can overstretch more than desired. When this happens, it is time to consider replacing your pair of cleats. The Nike Mercurial Vapor XI NJR FG Soccer Cleats are comfortable to the feel, and they are a better fit than most other cleats. The leather from which it is made does not get in the way during the game, and in any case, it provides a better feel and grip for the ball. They also offer more protection to the feet, because the material from which they are made is thicker than the one used for other types of cleats. This is an advantage to the player who has the most exposure to a lot of beating. The design of some cleats can cause injury to the ankle. The makers of the Nike Mercurial Vapor XI NJR FG Soccer Cleat have ensured that the ankle cut is protective to this area. In addition to having great padding around the ankles, there is also considerable support in the sole structure. This feature deters the heel and ankle from injuries by providing support and proper posture. 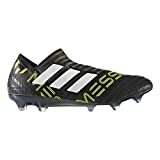 The modifications that have been made from the traditional soccer cleats to give rise to the modern version has seen them offer more comfort to the players. Stud patterns on the base of the boots highly depend on the sport for which the cleats are made. As for this particular design, the studs are made of rubber to improve traction and to minimize injury to other players. The studs are also a combination of blade and conical designs. Bladed studs reduce the pressure, provides higher speed and traction, while the tapered aspect of the studs makes the boots more stable. Should you wear them while playing on a sturdy surface, you can be assured of reduced injury risk and proper traction. In comparison to other cleats in the market, the Nike Mercurial Vapor XI NJR FG Soccer Cleat has a lace-up ankle brace that is strong enough to resist unexpected forces. They also keep the body stable while running and walking, hence providing stability to the ligaments, foot and lower leg muscles, and the bones which are prone to injury. The ankle brace can be bought separately in the case of wear and tear. The mid-sole has a molded sock-liner, which gives support to the arch of the feet and also ensures a comfortable fit. The out-sole is lightweight, made from a combination of bladed and conical studs. The design provides room for traction, penetration, and pressure dispersion. Embossed horizontal ridges increase ball awareness and control. Lightweight compressed nylon plate is contoured to mirror the foot's shape. Tongueless construction wraps the foot for a snug, locked-down fit. Low-profile toe box helps you get under the ball.